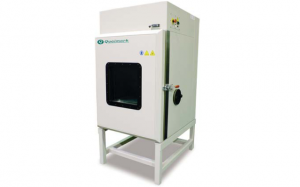 The Qualmark Typhoon 2.0, with its 24” x 24” vibration table, is perfect for performing Highly Accelerated Life Testing (HALT) on small products, or where limited lab space is available. This compact system is built using Qualmark’s Typhoon system technology which delivers impressive thermal performance and six-degree-of-freedom repetitive-shock vibration, and is highly efficient in LN2 usage and power consumption. The Qualmark Typhoon 2.0 is a practical addition to any company’s product reliability program. The Qualmark Typhoon 2.0 is the perfect size for HALT testing small to medium electronics products. Whilst it’s size is small it’s impact on development is massive, you’ll save time, energy and frustration with the 2.0’s ability to quickly point the finger at weak spots in your designs.